Sometimes when you're job searching, the wait at each step in the hiring process can feel interminable. You wait to see if the employer received your resume. Then, you wait to see if you will be selected for a job interview. Then you wait for the interview that is probably a week away. Then, on the day of the interview, you're nervous and worried and still waiting because the interview's at 3 p.m. Perhaps some insight into the steps an employer takes to hire an employee will help you understand what is going on behind the scenes. It's not about you, for the most part. Recruiting and hiring an employee usually starts with a recruitment planning meeting and moves on from there. Applicant resume review by Human Resources and the hiring manager is a lengthy process while you have no idea if the employer filed your resume among those of the most qualified applicants - or not. Some polite employers automatically generate a candidate response form letter thanking you for submitting your resume. So, in these cases, you know the employer received it. Once the HR people contact you to schedule an interview, depending on whether the organization uses a team approach - which I recommend - scheduling the interview team can take several weeks. The wait can feel especially long after you experience your first interview as you wait to hear if they will invite you back for a second interview to meet more potential coworkers. In a large company, sometimes bureaucracy adds layers of time to the hiring process. Plus, you might be competing with a large pool of candidates. 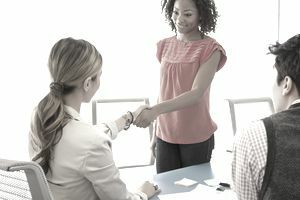 In a state, federal, or local government position, the employer takes many steps to consider internal candidates, too, prior to considering external candidates. Sometimes, between the start of a recruitment and the job offer, an agency loses funding for the position. And, organizations are becoming notorious with job searchers for failings in courtesy and thoughtfulness in their communication with candidates. Many organizations don't and claim that it's a time and resource issue. A lot depends on how fast the company is growing, too. In a fast-growing company, the Human Resource staff members are generally swamped with employee recruiting. At the same time, in a fast-growing company, many of the work systems are broken. What worked for 75 employees no longer works at 150 or 200 employees. So, the people who are responsible for leading the charge and hiring new employees are doubly swamped; they are creating their hiring systems and recruiting good people as fast as they can - at the same time. It's a challenge to get back to candidates even to schedule a second interview. What can you do in the meantime? Make sure that you send a thank you letter following the first interview. You will also want to keep your job search system up-to-date and moving forward. A polite phone call is often returned. And, just one time, you can send the Human Resources staff person or the hiring manager an email asking about the status of the position they are filling. In an employee empowering and participatory work environment, the number of people involved in a hiring decision makes selection challenging, too. Just getting five or six people together to do an interview can take several weeks. But, you don't want to work for a company that does not empower and enable employees, so often the best companies take the longest. I hired an employee once who told me she had a job offer on the table during our first interview. I told her truthfully that our company would not make an offer to anyone for a minimum of three weeks, so she would need to decide. She turned down the offer and waited because she wanted the job I had available. It turned out to be a good choice for her - we hired her.